Plastic Limit Test for Soil Testing - Moisture contents at which soil has smallest plasticity is called limit. For determination purpose plastic limit is defined as the water content at which a soil will just begin to crumble when rolled in to a thread of 3mm dia. Specification : The complete set consists of one each : 1. Glass plate 20cm x 15cm having round ends 2. Brass or stainless steel rod 3mm dia x 150mm long 3. Flexible spatula 15 cm 4. Set of 6 moisture containers 5. Porcelain basin 150mm dia 6. Plastic wash bottle 500ml Glass Plate size 500 x 500 x 10mm can be supplied at an extra cost..
We are leading manufacturers, suppliers & exporters of Plastic Limit Test For Testing Lab for Soil Testing Lab. 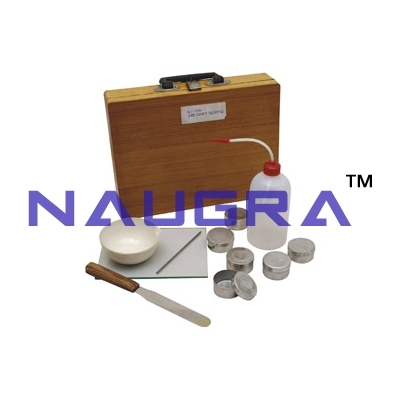 Contact us to get high quality designed Plastic Limit Test For Testing Lab for Soil Testing Lab for schools, colleges, universities, research labs, laboratories and various industries. We accept bulk orders for government tenders in all countries around the globe.